So, this is one of those books, I ended up reading it at home as well though, because I started enjoying it so much. I purchased this copy from Amazon.com for free, here. It took a bit for me to get into this one, I ended up having to go back and re-read the first 30% of the book. Once I got into it though, it really pulled me into the storyline. 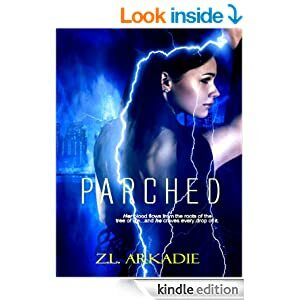 The characters are interesting, and there is a bit of a spin on modern religion in there, which added depth to the story, but for me I thought it was a bit cheesy to add the whole religion bit in there amongst the vampires and other things. It just seemed a bit off with the scope of things, but it's so minor it's barely noticeable. The romance can be a bit frustrating at times, as most new romances can be I suppose, haha. I really enjoyed this book, though it definitely makes you want to go for the next book with some real build up and then you just get left wondering. Hence I went for the next book as well. For a quick read I'd say it was pretty decent, a bit tough to get your head around all the details in the beginning, but maybe that was my a-hole bus drivers fault with his heavy foot and jerky start stops..lost my place a couple times. Go on, if you like paranormal romance, go for it, its free, why not.